The Real Threat to Sisi: His Own Inept House? The title of this post summarizes the opinion of an article in International Policy Digest, describing two main camps among Sisi’s power base. Both the military/institutions of state and the business/media/political elite are used to cooperating, but are so used to the rules of the old game they don’t realize the world has changed. An example of that is the appointment of the prominent Egyptian scientist, Dr. Essam Heggy, as an advisor to Egypt’s interim president. Dr. Heggy’s appointment coincided with the scientific scandal in the Egyptian army which claimed to possess (false) medical invention to treats AIDS and Hepatitis C which was supposed to enhance Sisi’s image locally and internationally. Dr. Heggy harshly criticized the disreputable invention. As a result he was accused by the institutions of being an American spy, a member of the Muslim Brotherhood member and of undermining Egypt’s national security. In the past, institutions functioned under the authoritarian command of Mubarak whose regime was experienced in handling their behavior. But in Sisi’s case, the rampant level of delinquency and irrationality that surrounds his regime runs counter to his interests. He is simply unable to control them for multiple reasons that could vary from lack of will to his inability to realize the problem itself. Sisi himself is a product of those institutions. He was raised, educated and is an integral part of their doctrine so chances that he realizes the fatality of these flaws – let alone the need to reform them – remains slim. This article hits at a theme that has long plagued analysis of the Egyptian scene. Since 2011, in lieu of facts I have struggled to wade through conspiracy theories because a common axiom was so consistently violated by so many players: Do not act contrary to your own interests. 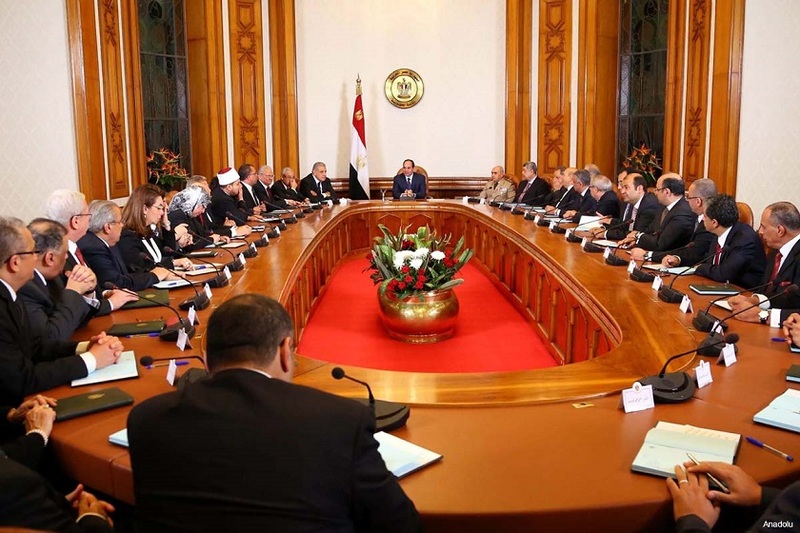 One question is fair: Blindness is possible, but is Sisi’s house really so inept? One could argue that Egypt has navigated great social upheaval relatively well in effort of securing the most important locus of support — domestic. Even if academics, activists, and idealists groan. But another question is necessary: Does Sisi not know? I would guess he fully realizes the nature of Egyptian bureaucracy and is working to instill fresh blood. If the author’s thesis is correct, he still may not be able to do so, as Egyptian institutions guard their independence and the new constitution weakened the traditional centrality of the state. But it could also be it is not fully time yet. If he needs all on his side, then how can he slice through a bloated bureaucracy? But look at the steps taken on subsidies. Look at the reform of the bread market. Look at the appointment of civilian governors. The author is ignoring difficult decisions neglected by previous administrations. Then again, look at the introduction of coal. Look at the absence of a parliament. And analysts say the army is better equipped for traditional conflict than it is for fighting a terrorist insurgency. It is a very mixed bag. But is it not time yet? That is not Sisi’s spoken perception. Upon his election he asked for two years to get the Egyptian house in order. The clock is ticking, but he is aware of its hands. He constantly demands something be done now, very contrary to Egyptian culture. Sisi’s regime will only recognize this fatality when the international community further downgrades his posture and when Egyptians run out of patience and recognize that no single progress has been made in any field including security – which was a prime reason why people voted for Sisi. By then, it will certainly be too late for him to reform or repair the damage.